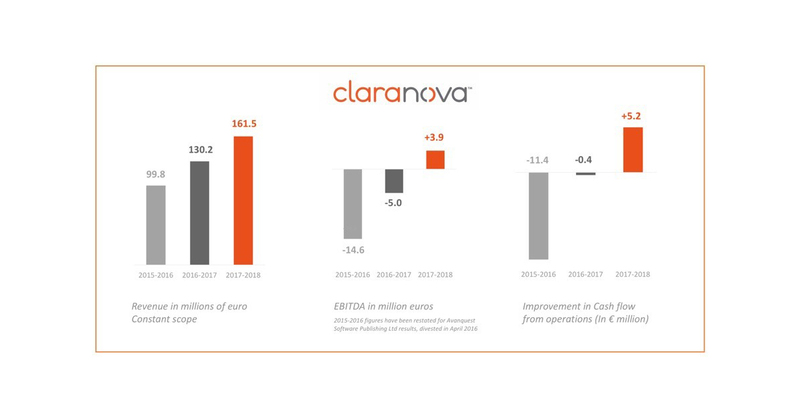 Claranova (Paris:CLA) reports significant across-the-board improvements in results for FY 2017-2018, confirming its return to operating profitability1, while keeping a firm focus on strong growth. For the year ended June 30, 2018, the Group reports consolidated revenue of €161.5 million, up +32 at constant exchange rates (+24% at current exchange rates), generated 93% outside France. The Group’s operating profitability indicator (EBITDA1) is now positive at €3.9 million, an improvement of €8.9 million year-on-year, with a 6-point increase as a percentage of revenue (+2.4% of revenue in FY 2017-2018, compared with -3.8% in FY 2016-2017). This €8.9 million improvement was achieved despite an increase in PlanetArt’s marketing investment of 28%, highlighting its virtuous growth model. On this basis, Recurring Operating Income (ROI) also increased by +€6.9 million to -€3.7 million, after the impact of share-based payments expenses (€7.1 million). Similarly, Net income, Group share, is -€7.9 million, up +€3.1 million year-on-year. Restated for share-based payments expenses (€7.1 million), ROI would be +€3.4 million and Net income, Group share, would be close to break-even at -€0.8 million. The Group’s successful development is further confirmed by the generation of positive cash flows from operations of +€5.2 million (-€0.4 million in FY 2016-2017). Cash flow from operations has improved steadily over the past three years, with Group growth generating cash in FY 2017-2018. At June 30, 2018, Group cash is €65.7 million, up €48.6 million year-on-year. This improvement is also due to the €29 million ORNANE3 bond issue performed in June 2018. In FY 2016-2017, PlanetArt demonstrated the relevance of its business model, all but reaching operating break-even. This business has now entered a virtuous profitable growth cycle, reporting EBITDA of €6.4 million (5.2% of revenue), compared with -€0.3 million last year. Revenue growth also remains strong (+37% and +47% at constant exchange rates) and PlanetArt continues to invest heavily in its geographical expansion and the development of its product range, launching new offerings and applications (FreePrints Photo Tiles). The Avanquest division unsurprisingly reported a controlled organic contraction of 3% at constant exchange rates year-on-year to €35.8 million (-7% at current exchange rates), while improving its profitability with EBITDA of €0.7 million. On July 1, 2018, Avanquest completed the first stage in its consolidation strategy with the acquisition of the Canadian businesses, Upclick, SodaPDF and Adaware. While these acquisitions did not contribute to division revenue for FY 2017-2018, the initial impacts should be felt from FY 2018-2019 following their integration into the Group. A significant improvement in Avanquest’s profitability is expected in line with the Group’s strategy. For example, had these three businesses been consolidated from July 1, 2017, Avanquest would have reported revenue of €65.7 million4 and EBITDA of €6.5 million4, i.e. an EBITDA margin of 10%. Finally, in 2017 and 2018, the myDevices subsidiary (IoT, Internet of Things) signed strategic partnerships with operators in America (Sprint) and China (Dr Peng) for the commercialization of its “IoT in a Box” solutions. This business therefore saw its first monetization income in FY 2017-2018, with the Sprint agreement generating over USD 2 million in revenue and improving EBITDA by €1.6 million, i.e., over 30%. The division will continue its commercial deployment through new partnerships focusing particularly on reseller networks, like those already announced in September 2018 with Alibaba Cloud in China and Ingram Micro in the United States. Group EBITDA has therefore improved by €8.9 million and is now positive at +€3.9 million. Including the activities of the companies acquired on July 1, 2018 as if they were consolidated from July 1, 2017, Group revenue would be €191.4 million4and EBITDA €9.7 million4, up +47% and +€14,7 million respectively. Since its launch, PlanetArt has reported strong growth annually, multiplying its revenue by 3.7x in three years (€122 million in FY 2017-2018 compared with €32.9 million in FY 2014-2015). After the global success of its first application, FreePrints, PlanetArt continued to monetize its customer base with the launch of a second application, FreePrints Photobooks (early 2016), followed by a third one, FreePrints Photo Tiles (June 2018). This new application offers users the ability to create repositionable wall art décor from their photos. The successful development of FreePrints Photobooks has already enabled a significant increase in the PlanetArt division’s profitability since its launch. While the initial results of the FreePrints Photo Tiles application did not significantly impact the financial statements for FY 2017-2018, they should help strengthen the business in the future. PlanetArt is therefore continuing to develop, with the launch of new high-margin products that it can distribute to its vast customer base at low marketing cost. At the end of September 2018, PlanetArt also announced the launch of its FreePrints application in India. PlanetArt is now operating in the world’s second largest smartphone market ahead of the United States (source: Canalys research institute). The Indian market offers strong growth potential, backed by a booming economy and a population of over 1.3 billion, one-quarter of whom are smartphone users (source: emarketer). In FY 2017-2018 and for the first time since its creation, PlanetArt reported positive EBITDA of €6.4 million compared with -€0.3 million in FY 2016-2017. The division has now exceeded its break even point and business development through new offerings and geographies should be profitable going forward, despite ongoing high marketing investment to support growth. Bolstered by upcoming developments, the Group confirms its strategy for PlanetArt founded on two objectives: continued sustained business growth, notably in new geographies, while preserving profitability through the launch of new high added-value products. The Avanquest division completed the first stage in its consolidation strategy to become a European leader in monetizing Internet traffic, when it finalized, on July 1, 2018, the takeover of a Canadian group of three businesses: Upclick, SodaPDF and Adaware. Internet security with the Adaware anti-virus and security solutions, known worldwide. This group represents total revenue of approximately USD 37.6 million4 and EBITDA of USD 6.9 million4 for the period from July 1, 2017 to June 30, 2018. This transaction marks a major step in the realization of Avanquest’s mid-term goal to become a European player with revenue in excess of €100 million and profitability of 15% to 20%. As the Upclick, SodaPDF and Adaware Canadian businesses were acquired on July 1, 2018, they did not contribute to either revenue or net income of the Avanquest division in the fiscal year 2017-2018. The division therefore reported a slight dip in revenue year-on-year, with an improvement in EBITDA in line with its focus on profitability. The first impacts of this transaction will be reflected in FY 2018-2019 following the integration of the Canadian companies in the Group, enabling a significant improvement in the division’s margin rate to be anticipated. Had these companies been consolidated from July 1, 2017, Avanquest would have reported revenue growth of 83%4and EBITDA of €6.5 million4, a margin of 10% of revenue. The strategic partnerships announced at the end of 2017 and in early 2018 with leading operators such as Sprint (United States) and Dr. Peng (China) established the first monetization sources during the fiscal year and generated revenue of over USD 2 million following the launch of the “Sprint IoT factory” marketplace on May 4, 2018. In addition to these agreements, myDevices recently launched its “IoT in a Box” offering for resellers, aimed at further developing this market. Resellers can now order their “IoT in a Box” online and receive delivery within 48 hours, for sale directly to their customers. In September 2018, myDevices also announced partnerships with Alibaba Cloud (in China) and Ingram Micro (in the United States), offering its turnkey IoT solutions to their own reseller networks, systems integrators and solution suppliers. These partnerships will help accelerate the roll-out of ready-to-use IoT solutions in China and the United States, notably in the medical, hotel, food and beverage, retail and education sectors. EBITDA as % Revenue n.r. n.r. The division’s EBITDA improved during the fiscal year thanks to early revenues generated by the “Sprint IoT Factory” marketplace, but continues to bear the cost of investment necessary to ensure its development. Improved activity levels are confirmed by positive cash flow from operations, that progressed €5.6 million from -€0.4 million in FY 2016-2017 to +€5.2 million in FY 2017-2018. Cash flows demonstrate the marked improvement in the Claranova group’s financial position. The cash position increased by €48.8 million, excluding foreign exchange impacts, some eight times the increase recorded last year (€6.1 million). As of June 30, 2018, the Group has €65.7 million cash, notably following the ORNANE bond issue in June 2018 for a total borrowing of €28.2 million. This represents a significant improvement in the excess cash position to €37.5 million as of June 30, 2018, compared with €16 million one year previously. In a context of strong revenue growth, Claranova confirms its return to operating profitability, reporting positive EBITDA of €3.9 million, an improvement of +€8.9 million year-on-year. After non-recurring expenses in respect of share-based payments of €7.1 million, Group recurring operating income improved +€6.9 million to -€3.7 million for FY 2017-2018, compared with -€10.6 million for FY 2016-2017, representing a 6-point improvement in the recurring operating margin. For the third year running, Group full-year revenues increased over 32% (at constant exchange rates, +24% at current exchange rates) to €161.5 million for FY 2017-2018, compared with €130.2 million for FY 2016-2017. This strong growth is consistent with the Group’s strategy to develop each of its divisions and particularly PlanetArt’s mobile business. During the fiscal year, the Group exceeded its break even point and levered past investment to attain critical mass in the profitable mobile printing market. EBITDA increased by +€8.9 million, representing a 6-point improvement in the margin rate. Claranova reports EBITDA of €3.9 million for FY 2017-2018. The Group’s consolidated financial statements include non-recurring expenses in respect of share-based payments of €7.1 million (primarily non-cash), with a significant impact on Recurring Operating Income. ROI is nonetheless significantly improved on last year, at -€3.7 million compared with -€10.6 million in FY 2016-2017. Recurring Operating Income (ROI) is negative -€3.7 million, compared with -€10.6 million in FY 2016-2017. ROI in 2017-2018 notably includes non-recurring expenses in respect of share-based payments of €7.1 million (IFRS 2 expense of €4.1 million and social security contributions of €3.0 million), related to the valuation of free share grants and stock options. Operating income also improved to -€6.1 million compared with -€10.1 million one year previously. The above improvement in ROI is slightly offset by other operating expenses related to the restructuring of the group (legal and operational) and costs associated with the acquisition of the Canadian companies on July 1, 2018. After a net financial expense of -€0.3 million, down on last year (-€0.9 million), Net income, Group share continues to improve over the period, progressing from a net loss of €11 million in FY 2016-2017 to a net loss of €7.9 million in FY 2017-2018. This net loss is mainly due to IFRS restatements unrelated to activities and does not impact the Group’s cash position of €65.7 million as of June 30, 2018. Finally, due to the importance of its international activities, notably in the United States and the United Kingdom, the Group was negatively impacted by foreign exchange impacts during the period. These impacts were, nonetheless, partially offset by the natural hedge provided by activities developed locally. Non-current assets total €1.3 million as of June 30, 2018 compared with €2 million as of June 30, 2017 and primarily consist of intangible assets. Current assets increased slightly to €13.4 million as of June 30, 2018 from €11 million as of June 30, 2017, in line with activity growth during the fiscal year. Cash is up significantly at €65.7 million as of June 30, 2018, due to improved cash flow from operations and financing activities during the year. Borrowings total €28.2 million as of June 30, 2018 and primarily consist of the bond issue performed in June 2018. Current liabilities total €37.1 million as of June 30, 2018 and mainly consist of trade payables. The increase year-on-year is mainly due to strong growth in the Group’s activities and the recognition of a provision for social security contributions in connection with the free share grant performed in November 2017. As of June 30, 2018, the company financial statements of Claranova SA present shareholders’ equity of €79.4 million and cash of €19.3 million. The Claranova Registration Document for fiscal year 2017-2018, filed with the Autorité des Marchés Financiers (AMF, French Financial Markets Authority) on October 2, 2018, is available on the AMF’s website (www.amf-france.org) and on the Claranova website (www.claranova.com). This press release contains forward-looking statements concerning Claranova’s financial position, operating results, businesses, strategy and projects. Although Claranova believes that the forward-looking statements are founded on reasonable assumptions, they do not give any assurance as to the future performance of the Company. Actual results may differ significantly from forward-looking statements due to a certain number of risks and uncertainties, the majority of which are beyond Claranova’s control and notably the risks described in the Registration Document containing the 2016-2017 annual financial report filed with the AMF on October 2, 2018. This Registration Document may be consulted on the Company’s website. This press release contains forward-looking information that may only be interpreted at the date of its communication and Claranova refuses any intention or obligation to provide, update or revise any forward-looking statements, as a result of new information, future events or other factors. The Company’s individual and consolidated financial statements for fiscal year 2017-2018 were approved by the Management Board and reviewed by the Supervisory Board on September 28, 2018. They will be presented for vote to the Annual General Meeting of Shareholders to be held on November 29, 2018. The Company will communicate the details and legal information concerning this Annual General Meeting within the applicable legal time periods. – Avanquest: A specialist in monetizing Internet traffic through cross-cutting solutions, Avanquest boosts its customer impact through cross-selling offerings that maximize Internet traffic while ensuring the most efficient monetization possible. EBITDA is the indicator used to monitor the operating profitability of the businesses. It is equal to Recurring Operating Income before the impact of share-based payments, including related social security expenses and depreciation and amortization. 1 In terms of EBITDA. EBITDA is the indicator used to monitor the operating profitability of the businesses. It is equal to Recurring Operating Income before the impact of share-based payments, including related social security expenses (€7.1 million in FY 2017-2018) and depreciation and amortization (€0.5 million in FY 2017-2018). 2 At constant exchange rates. 4 The auditors of the companies carrying the Upclick, SodaPDF and Adaware businesses, RCGT, performed a limited review of the data presented in this press release for the Canadian entities. This data was not audited by the Group’s auditors. 5 Revenue and EBITDA of Upclick, SodaPDF and Adaware are included as if these businesses were consolidated from July 1, 2017.